We deal in manufacturing of Rubber Rollers which are designed for hosiery, plastic, large scale printing and steel plants. These are manufactured using high quality raw material which makes it corrosion and crack resistant. Rubber Rollers are manufactured with different specifications for different application areas and are offered at industrial leading prices. 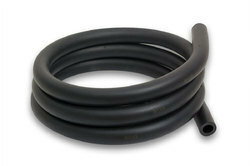 We offer Rubber Tubes to clients at economical prices. This tube is known for being durable and highly stretchable. Looking for Rubber Rollers ?